Panch prayag is cannotation used to expression confluence of five sacred rivers in the Garhwal region of Uttrakhand. 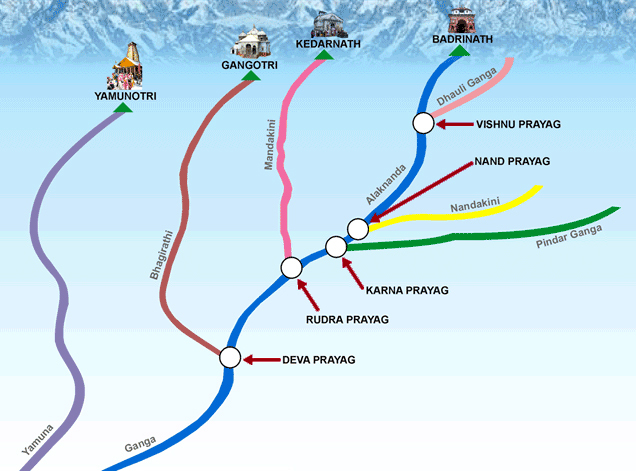 Panch prayag are Vishnuprayag, Nandprayag, Karnaprayag, Rudraprayag, Devprayag. Panch prayag holds the great significance in Hindu religion are visited by Hindu devotees to seek the blessing of Maa Ganga. According to mythology, earth was unable to bear the force of Ganga and to control to flow it was devided into 12 channels. And the confluence of these channels is prayag. Devprayag is last prayag where the Alaknanda meetsBhagirathi to take form of Ganga. Panchprayag is connected via Rishikesh.